A polyisobutene (PIB) spill has left hundreds of birds along the eastern and southern coasts of England sickened or dead, according to the Devon Wildlife Trust. The birds have washed up on beaches in Cornwall, Devon, Dorset, and Looe covered in an oily and sticky substance that experts have deemed to be PIB. 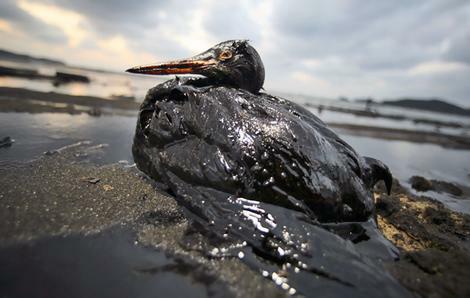 PIB is an oil additive that was also responsible for a similar incident recently, in which over 300 birds were affected. Over the past week, more and more birds have washed up, with an increasing number of them already dead. But some live birds are still coming in extremely sickened and in desperate need of assistance. PIB, is extremely difficult to wash off, though. Soapy water was found by the RSPCA’s West Hatch center in Taunton to be ineffective. Margarine has been nominally more successful. Birds have ranged from guillemots to puffins to razorbills. So far, the spill source has not been traced by the Maritime and Coastguard Agency, a failing which conservationist Richard White attributes to the lack of visibility of marine wildlife protection.